I've jumped on that leopard print bandwagon like no one's business. And I have no shame. Especially since this top was yet another thrifted gem from my local consignment shop. My favorite part of the top, aside from the fact that it was thrifted, is its twist front detail. It doesn't photograph very well without some carefully planned posing, so I tried belting it to help define the ol' waist. Belt it with a subdued sparkly gold belt I did, and I even did yet another photo shoot, but the boyfriend vetoed the belt in favor of the twist. He's right, of course. I'm not really sure why, but I felt that I looked older, even matronly, in the top. It's just not a very youthful design, regardless of the animal print. Maybe it's the collar - I dunno. 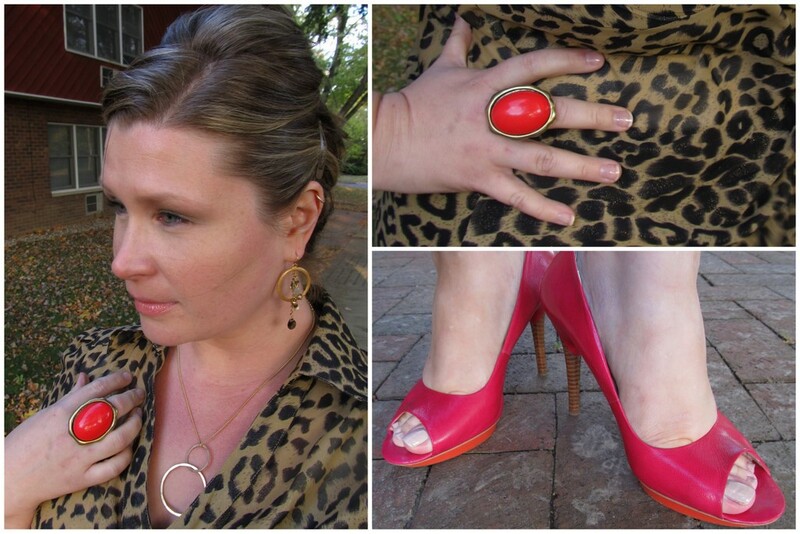 Cue bright pink pumps and big coral ring. I rather love the combination.